DICT, FILE, FTP, FTPS, Gopher, HTTP, HTTPS, IMAP, IMAPS, LDAP, LDAPS, POP3, POP3S, RTMP, RTSP, SCP, SFTP, SMB, SMBS, SMTP, SMTPS, Telnet and TFTP. curl supports SSL certificates, HTTP POST, HTTP PUT, FTP uploading, HTTP form based upload, proxies, HTTP/2, cookies, user+password authentication (Basic, Plain, Digest, CRAM-MD5, NTLM, Negotiate and Kerberos), file transfer resume, proxy tunneling and more. curl is free and open source software and exists thanks to thousands of contributors and our awesome sponsors. The curl project follows well established open source best practices. You too can help us improve! The most recent stable version is 7.64.1, released on 27th of March 2019. Currently, 65 of the listed downloads are of the latest version. Check out the latest source code from github. 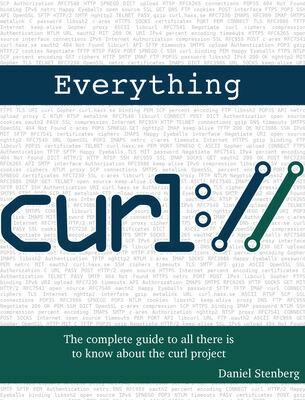 Everything curl is a detailed and totally free book available in several formats, that explains basically everything there is to know about curl, libcurl and the associated project. Everything curl is itself an open project that accepts your contributions and help.